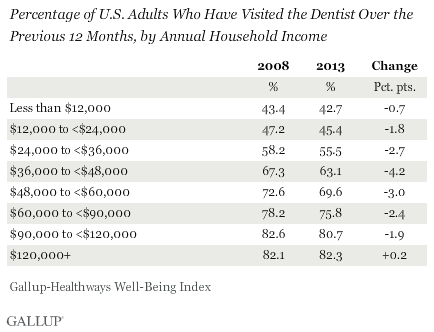 WASHINGTON, D.C. — About one in three U.S. adults say they did not visit the dentist at some point in the past 12 months. 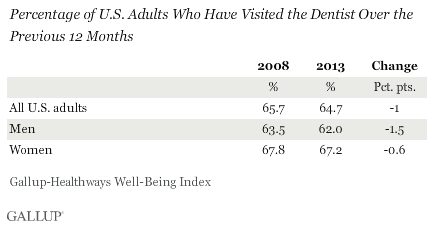 The 64.7% in 2013 who said they did visit the dentist at least once in the previous year is essentially unchanged from the rate found in 2008. 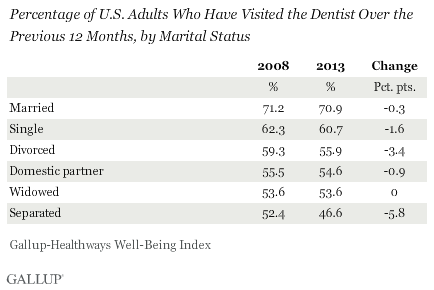 Women are more likely than men to report visiting the dentist annually. Marital status also influences dental decisions, with those who are married much more likely to report visiting the dentist annually than those who are not married. 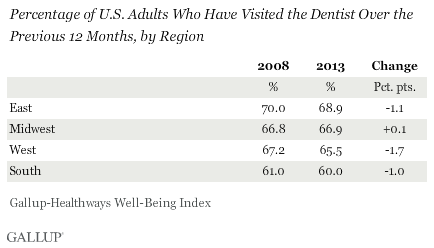 Those who are separated are the least likely to report visiting the dentist, and rates have dropped the most among this group — nearly six percentage points — since 2008. 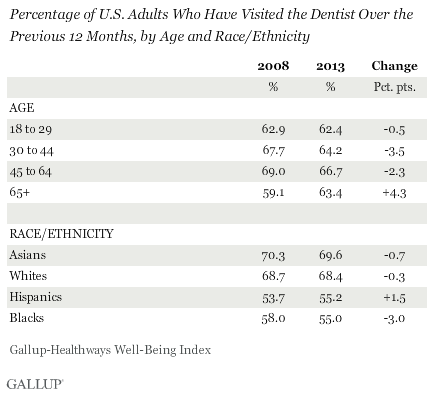 The percentage of adults visiting a dentist in the past year varies widely across the major U.S. racial/ethnic boundaries, and may reflect several factors, including household income. Having health insurance coverage — which is related to income — also appears to be a meaningful factor in dental visits, although the Affordable Care Act may help minimize the disparities in professional dental care among income groups. According to the Congressional Budget Office, as many as 17 million adults could gain some form of dental coverage via the ACA over the next several years. Survey MethodsResults are based on telephone interviews conducted as part of the Gallup-Healthways Well-Being Index survey Jan. 2-Dec. 29, 2013, with a random sample of 178,072 adults, and Jan. 2-Dec. 30, 2008, with a random sample of 354,645 adults, aged 18 and older, living in all 50 U.S. states and the District of Columbia.